The ash plume from Guatemala’s Volcan de Fuego, as captured on June 3, 2018, by the Visible Infrared Imaging Radiometer Suite (VIIRS) on the NASA/NOAA/DoD Suomi NPP satellite. Satellites are keeping tabs on a powerful volcanic eruption in Guatemala that has killed dozens of people. Volcan de Fuego, which lies about 40 miles (70 kilometers) southwest of Guatemala City, has been simmering for years, occasionally flaring up with bouts of dramatic activity. Tragically, one such outburst occurred on Sunday (June 3). The blast and resulting flows killed at least 62 people, according to media reports, and the death toll will almost certainly rise as rescue teams continue sifting through the wreckage and the rubble. Satellites are too far removed to capture the full scope of this devastation, but they did spot some imprints of Sunday's eruption. 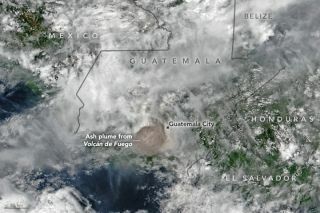 For example, the Suomi National Polar-orbiting Partnership (Suomi NPP) satellite — a joint mission involving NASA, the National Oceanic and Atmospheric Administration and the U.S. Department of Defense — imaged Fuego's ash plume, which punched through overlying clouds. Suomi NPP made this observation using its Visible Infrared Imaging Radiometer Suite. Another instrument aboard the satellite, the Ozone Mapping Profiler Suite, measured sulfur dioxide spewed by the volcano, allowing scientists to create a map of the gas in the middle troposphere, at an altitude of 5 miles (8 km), NASA Earth Observatory officials said. This map showing concentrations of sulfur dioxide spewed by Guatemala’s Volcan de Fuego was made using data gathered by the Suomi NPP satellite’s Ozone Mapping Profiler Suite on June 3, 2018. Europe's Copernicus Sentinel-5P satellite has also been sniffing out sulfur dioxide in Fuego's plume, as an image taken on Sunday shows. The roughly 12,300-foot-tall (3,750 meters) Volcan de Fuego — whose name means "Volcano of Fire" in Spanish — also erupted in February, blasting ash nearly 1.2 miles (2 km) into the sky, European Space Agency officials wrote in a description of the Sentinel-5P image. But Sunday's outburst was more powerful, sending ash 3.6 miles (6 km) high, they added. Europe’s Copernicus Sentinel-5P satellite measured sulfur dioxide in the plume spewing from Guatemala’s Volcan de Fuego on June 3, 2018. Fuego's latest eruption comes after an outburst by the Kilauea volcano, on Hawaii's Big Island. Kilauea has been erupting for 35 years, but its activity began surging in early May. The Kilauea outburst has caused no known fatalities to date.